Notes: Morpeth Castle is a Scheduled Ancient Monument and a Grade I listed building at Morpeth, Northumberland, in northeast England. It has been restored by the Landmark Trust and is now available as a holiday rental home. The original motte and bailey dating from the 11th century was built on a hill overlooking the River Wansbeck and destroyed by King John in 1216. A new castle was built in the bailey of the original in the 1340s, but little of that structure survives apart from parts of the curtain wall and the much altered gatehouse. 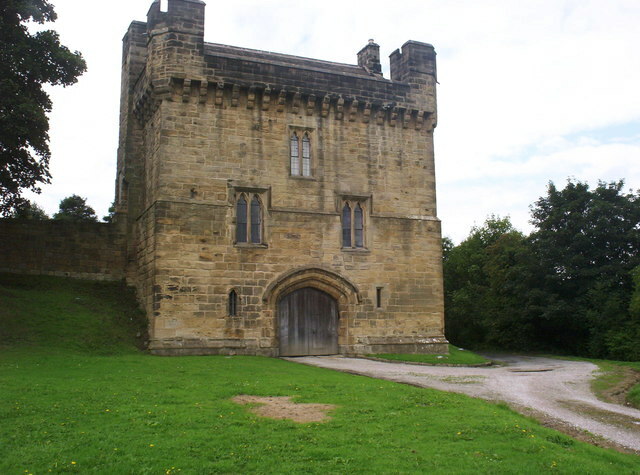 In 1516 Margaret, sister of Henry VIII and widow of James IV of Scotland, stayed for four months in Morpeth Castle as she fled from her enemies in Scotland and sought refuge with her brother. The one great military event in the castle's history was in 1644 when a garrison of 500 Lowland Scots held it for Parliament for 20 days against 2,700 Royalists. The castle was held by and passed by the female line through several illustrious families; de Merlay, Greystoke, Dacre and Howard, none of whom resided there for any long period. In about 1860 the gatehouse was restored and converted to provide a staff residence.